We visited Clearwater Beach last spring and we finally arrived there after a very long day of being stuck on the side of I-4 near Daytona Beach for almost 6 hours. It was a very long day and a very hot one at that, not to mention being so upset because my jeep broke down. We did however finally make it there late that night and despite the fact that we had to rent a car and unconvinced my father by having him drive down to Daytona after the trip to get us, we loved the beach! We had such a great time there and want to come back again so bad! It was a time I will never forget. Hi, I am Frank from Bremen, Germany, I am 31 years old, and I like Clearwater Beach so much!!! You can't believe it, but I think very often to your wonderful white beach and Pier 60. I hope , I will come back soon. I grew up in Clearwater, and my husband and I try to get back there as much as possible. We are trying to retire there, it is really wonderful. There is no place friendlier than Clearwater. I love the people, the place, the attitude. My wife and I have been vacationing every year in Clearwater Beach since 1984 and love every minute of it. We just came home from there and were a little disappointed. The small motels and various shops, restaurants, etc. ; make Clearwater Beach unique, however it now appears that they are destroying the landscape with condos. We don't know if we will be back again. We live in Daytona Beach and have been witness to the greed of the developers. Clearwater Beach is the Best place i have ever been. I go there every year and I NEVER get bored. From the boats to the dolpins in the Gulf of Mexico, this place is wonderful. i think everyone should have a chance to visit this place. I am going to grow up there and have my kids there too. I can't get enough of this place . CWB is a great spot for the family. There is plent to do and great views to see. Just going there to see the sunsets alone is worth the trip! My parents and I visit Clearwater Beach, FL. twice a year. We love it so much we are now trying to move there. The sunsets at Pier 60 are so spectacular they are enjoyed by people across the world. You speak to several people while on the pier and all say, "This place is the most beautiful place in the world." We love it! the beach is great. the water is so clear and beautiful. just came back from orlando. clearwater is the greatest. hoping to return this june or july. My family and I absolutely love Clearwater Beach, Fl. We vacation once or twice a year. My husband and I love it so much we were married there at a local Resort, right on the beach. (we visit every June to celebrate our anniversary). Everything you could possibly want to do is right there and most within walking distance. The locals are very friendly as well as all places of business. You cant go wrong with a vacation to Clearwater Beach. Vacationing at Clearwater Beach has to be the best gift our family gave to each other! For one week we enjoyed the fantastic sunsets, great seafood, walks on the Pier, and watched as our son caught a 6 foot shark! The memories will last us forever!! "My sister and I just got back from a week in clearwater. It was GREAT! It's my favorite place to be! We stayed at the holiday Inn SunSpee - it's just quite enough and just happening enough to have something for everyone. Everything is within walking distance and watching dolphins swim right from the shoreline was awesome." Have been going to Clearwater Beach for past 10 years for our vacation and love it...the beaches are the best in Florida...and the sunsets are spectacular to say the least. Now that my last daughter is graduating this year....I will continue to come to Clearwater Beach annually by myself. I moved from Philadelphia to Florida. I was at a bar in Orlando and overheard that Clearwater Beach was the spot to be so I moved there and immediatly fell in love. Clearwater Beach beats all others with the soft white sand, the warm calm water, the palm trees, the weather and everything. I lived about 20 feet from the sand in my very first apartment. Several months later bad news hit and I had to move home. I belong in Clearwater and I miss it everyday...I can't wait to go back. Florida is where my beach lives. "We visit Clearwater Beach (known as PARADISE in our house) at least twice a year, and at no certain time either! We vacation when we can, and that means March, May, July November, February...doesn't matter, it's CLEARWATER BEACH for this family...HOPE TO SEE YA'LL SOON!!" We have gone to Clearwater Beach Fl for 2 yr now. We love it there!!! What a great family time we have had. The beachez are beautiful!! Can't wait to go again. I vacationed here for the first time in june of 2000. I now live here. I moved here the later part of 2000. I love it here. I love everything about Clearwater Beach. Hi our names are Arron and Amanda Moon from London England we are coming over to Clearwater on the 15 th May this year and we can't wait we love it so much in fact it will be our 7th time out there. We really hope we can move out there one day the people are so friendly and make you feel really welcome. We normally stay at the SURF and SANDS MOTEL but this year we are staying at the CAVALIER RESORT MOTEL.We are always on the CLEARWATER website we have before looked into moving out there as this would be a dream of ours we hate living in England the weather is terrible the people are rude and the house prices are so high we can't afford to move out of our parent's house yet. We are coming over for 3 weeks and we are getting really excited as we have had this holiday booked for a year and it is finally here. My family and I went to clearwater beach last year for April vacation for our first time. I'm 16 years old, and I had a blast. It is the prettiest place I have ever seen. It's very relaxing, but fun at the same time. We did jet skiing in the Gulf of Mexico and that was so much fun! This year I asked my parents to go back again, and we are. It's an awsome place to go for vacation. Living in San Diego, I decided to get a taste of Florida and the best decision I made was to spend it in Clearwater Beach. The unspoiled beaches, friendly environment and abundent restaurants made it the best vacation I've taken in this country in a LONG time!!! The next time my family wants to go to Hawaii or some other exotic beach for a vacation, I am going to suggest we come back to Clearwater Beach. My husband and I bought a Timeshare here 2 years ago at Indiana Shores. It's the best investment we ever made. We love coming to Clearwater and will bring family and friends with us every year. There's so much to do. We're heading back this April! My husband and I have visited Florida many times but this is the first time to visit Clearwater Beach. I LOVED IT!!! I have been to a lot of beaches but this was the most beautifulust beach I have ever been. We vacationed this summer at Myrtle Beach, SC again but after going to Clearwater over the Labor Day weekend I fell in love with it and know that it will be where I vacation next year. "Is there a more wonderful beach in all the world? I love it!" We just got back from our vacation on Clearwater Beach. I am from Largo, so we like to stay on the Beach and visit family while we are down. I have to say, these are the friendliest people in the world. We stayed at the Holiday Inn Sunspree and they were great. We love watching the Dolphins in the Inter coastal Waterway right from our balcony. The restaurants on the beach are really good. What a great trip! Me and my wife got married on clearwater beach 5 years ago and since then we try to go back every year if we can afford it. I would leave england in a moments notice to live, there it's so clean the people are so freindly and make you feel so welcome that you feel like your at home from the moment you arrive. Were coming back in may for three wondreful weeks and the pair of us are counting the days until we get out there. Clearwater beach hotel is a great spot. Service, prices and overall family fun awaits you. Could not be happier with my time there. Clearwater Beach is the best place in the world. I keep coming back over and over and over and over and over and over and over again. "I'm the one who brought Bill from NJ to Clearwater Beach for the first time. It has everything you need for that special getaway. The white sandy beaches, the warm Gulf waters, and spectacular sunsets have called me back every year since 1979." We love Clearwater Beach!! We vacation here every year. We stay at the Hi-Seas Motel!! This is our home away from home. This is a great place! If been in Clearwater Bch. in 1979 for the first time. At this time I was 14 yrs. old. After that I visited Clearwater for 8 times again. last visit was in 1994. In those years I saw the changes that Clearwater made. I remember at the end of Bayway Blvd. Was just a little Golf place, now there a lot of shops and restaurants. It's a great place to stay.Now I'm 35 and I'm sure, that I'll visit Clearwater again. I just wanted to write to let you know how much my friend and I enjoy Clearwater Beach. We recently visited there ( my friend for the 13th year and myself for the 4th year) and I can tell you that the beach is as beautiful as in any picture you may find. Some of the best resteruants are located on the beach, including Seafood and Sunsets at Julie's. The staff there is always friendly and helpful and what a view! We plan to visit Clearwater Beach every year until we are too old to enjoy it. In other words--always! We love the businesses and hotels on the Beach and will continue to stay on Clearwater for the next several years. Thanks! Hello, Today is my second day at work since I returned from spending 7 days in Clearwater Beach, this was my wife's, daughter's and my self's second visit and my 1 year old son's first. We absolutely had a great time, most of it was swimming and basking in the sun, my daughter spent most of her time collecting beautiful shells on the shore. I'm planning to make CB my family vacation spot. "Having gone to Clearwater Beach for the past 15 years...there is no other place in Florida I would rather go...the beaches are superb; the dining is wonderful;it's paradise!We always stay at the same resort and we love it!" I started vacationing in Clearwater and on Clearwater Beach in 1982, when my mother moved to the area. After her husband's death, she moved back to Pennsylvania to be near us, but, each year, she and I continued to travel to Clearwater Beach for a two week vacation. We stayed in many different places, but finally started staying at Graham and Maria Coates' Ebb Tide Resort each year, where we were treated like family. Mom died in October of 2001, but I still returned to the Ebb Tide in May of this year, and plan to continue. I love the area and really enjoy staying at the Ebb Tide, where everyone is friendly and caring! "Our family has been vacationing at Clearwater Beach for the past 8 years. We love the beach, the family atmosphere, the numerous things to do there, and the safety we feel while we are there. We stay at the Ramada Inn Gulfview and my children love it! There's no other place we like to spend our vacation than Clearwater Beach." Cleawater Beach is great! I just got back from there last week! I love the festival at Pier 60! Clearwater Beach is the ultimate vacation spot !!! Been flying/driving there for the past 5 years and I will continue to do so. Clearwater is the much needed break from life's daily dose of Murphy's Law ! I have been visiting Clearwater since 1974....and have been there every year (sometimes a couple times a year) since then.....we stay at the same hotel for most of the time.. So many wonderful experiences have happened to us.. It is the ideal place to visit....You have two major cities within 20 miles, and the small town feeling for your enjoyment. You are only a few miles from all activities.....and yet on the water for all the fun and relaxation. This is the perfect place to be...the best of all worlds.......Come and see for yourself!!!!!!!!!!!!!! I was lucky enough to spend 10 days at Clearwater Beach in February for the first time in 18 years!!! Boy what a sight! It is still the most beautiful place in the world! I enjoy everything about it! I just hope that I can come back again next year for another great vacation!! We're a german family with 2 kids (15 and 6 aged) coming the third time after 2000 and 2001 to your beautiful place in west florida to escape the bad weather in our region and to enjoy the caribeen feeling of westflorida. We hope the weather will be in the way it was in the last 2 years and look forward to jump into the gulf. Just wanted to tell you I sure miss being on the Beach.....and wish you great success with your festival. I went to Clearwater with my family one spring break and I fell in love with a man who I can no longer find anywhere. He is a past memory that will last forever and he sang to me as we watched the sun set on the Clearwater Beach and I have not been content to this day because I have not found him. But those five days were the most amazing days I have ever had. Amazing hotel (Holiday Inn) wonderful food, incredible scenery, and amazingly romantic! What can I say? I love soaking up the sun and eating grouper snadwiches at Frenchy's. Life is a (clearwater) beach! Yeah!!! I got my t-shirt today from the website. Just makes me that more happy about Clearwater Beach!! My friend and I went to CB in July!! What a totally awesome beach!! The beach was so clean, relaxing, and just plain gorgeous!! I live in Ohio, and am dreading the cold months ahead, but I can brighten my day by looking at the web cam of the beach!! Someday I will come to Florida to stay forever, and as impressed as I am of Clearwater Beach, I think I found where my heart belongs in Florida!! If you want a totally spectacular paradise vacation.....go to Clearwater Beach, you won't be disappointed!! I had the time of my life there, and fully intend on making this my paradise vacation again, very soon!! Clearwater Beach is most definetely THE BEST!!!!!!!!!!! I really had 2 wonderful weeks of vacation and enjoyed superb weather, very delicious food, superb golf courses and the great landscape!!! I swear i'll come back in a few years! The beginning of May, my friend and I arrived in beautiful Clearwater Beach. This was her first visit, and my third. From the very beginning I had told her how wonderful it was, but I wanted her to see it for herself. Well she did. From the beautiful white sand of the beaches, the sunsets, the sunrises, everything within walking distance, and the local people, so accommodating. Well to say the least, she wants this to be an annual trip, and hopefully we will be able to do it for many years to come. Hello I am from Pittsburch and have been coming to clearwater beach for about six years. I love every part of the area, the food and beaches most of all. Frenchys has the best "buffalo chiken sandwich" in the world. I will be coming down July of 2001 for yet another trip and I am already counting the days. I spent two weeks travelling around florida,however once I reached ClearwaterI found it so atmospheric that I decided to spend my remaining four daysthere. Its an enjoyable yet calming place. "Absolutely my favorite vacation place anywhere! After introducing my girlfriend to my personal paradise in 1999, I knew in 2000 there would be no better place to propose to her than right on the beach. She said yes!!!!" I have traveled to Florida since I was big enough for a car seat, which has been all my life. My parents and I started coming to Clearwater Beach when I was a 5th grader and the first time here we stayed at what was then the Clearwater Beach Motel. I must say that things have changed since then. I'm now almost 30 years old and we're still coming to Clearwater Beach. Now we are staying at the revamped Clearwater Beach Hotel and enjoying the old section of the hotel. As an adult I appreciate even more now the magnificent sunsets and the relaxation that is so evident as soon as we get here. It's like a little piece of heaven, literally. I love the ocean and there's really nowhere else on earth that I can imagine relaxing as much as I can here. This is the ultimate vacation destination for us and will continue to be for years to come. Hi! I'm from Germany and I'm 31 years old! I have relatives and Palm Harbor! I love Florida and I love Clearwater Beach! I was on vacation in Clearwater Beach in 1990, 1993, 1995, 1996/97 and 1998!!! I love your beach, I love your sunset, I love your pirate boat and the wonderful view!!! We just returned to NY after a week in Clearwater Beach. My husband is a plow man and was happy that we left home when we did. The beautiful pristine white sand and the Gulfshore sunsets are the best ever. We'll be back because it was just the nicest place for the ocean and shore we've ever visted. Thank you, Clearwater, for hooking us on your sunshine and fun. I Loved my vacation to Clearwater Beach.The weather and the view we had right on the beach was just beautiful. It is a very friendly place and a lot of things were very reasonable. I do plan on going back for Christmas this year and next year I will definately be looking at property there. I would definately recommend this wonderful place to anyone and everyone. The sunsets are unreal!!!!!!!!!!!!!! We love Clearwater Beach. My husband and i just returned from there this past weekend. We were there about 10 years ago with our two sons. This time we went by ourselves. I love the beaches there, they are so clean compared to some we have seen. I would love to go back there next summer! We love Clearwater Beach and plan to return this summer. My husband and I have been to several different beaches in Florida (Atlantic side and Gulf side), and we can honestly say that Clearwater Beach is wonderful and our favorite. The beaches are clean and the water is just beautiful. Maybe some day we will consider retiring there, but for now we are happy to visit once a year and soak up that great Florida sun!! We love Clearwater and are thinking of retiring there. Hi, my Family and I have just returned from the most wonderful holiday that we have ever had. We spend 16 days in Orlando and the most amazing 5 days in Clearwater Beach. We intend to return to Clearwater Beach as soon as possible as the people were so welcoming and the place was fantastic and beautiful, if we could we would emigrate to there. "It was our first trip to Clearwater and it was the greatest!" I used to visit Clearwater Beach every summer as a child with my family and last year I took my 8 year old daughter on a mother/daughter weekend to show her what I love and she still begs us to go back for longer with dad and her 2 sisters. Everything is the same as I remember, even the smell of the outside beach showers. My great-grandma lived in a trailer right where the Hilton stands now close to the pier. Boy did I love that pier as a child, I was even aloud to walk it alone. My husband and I come to Clearwater Beach every year, and have since we got married twelve years ago. We love French'ys ORIGINAL. The grouper burgers and the fish spread are the best on the beach. And the sunsets are the best in Florida. My family and I have been travelling to Florida for the past 12 years and always visit Clearwater Beach for a week or two. We love the people and the sunshine and, of course, the endless stretches of sugar-white sand. Once we came to Clearwater for the first time, we never went anywhere else. I have been bringing my son to Clearwater since he was 2 years old and he says it is his most favourite place in the whole world. He is 14 now and planning how he can move to Clearwater when he grows up! I could go along with that! We have visited Clearwater Beach for the first time in 2002, it's very nice. We cain't wait untill we come in summer 2003. We stay ay the Coca Cabana. I am 36 years old and I have been vacationing at Clearwater Beach every year since my parents took me when I was 6 months old. I look forward to coming down to Clearwater Beach for Rest and relaxation every 4th of July week to get away from the hustle and bustle of city life in Atlanta Ga. and Clearwater puts on a great fireworks display 4th of July evening. "My family and I had our first Clearwater Beach vaccation this summer. We have been to Orlando 4 years in a row and this year decided to give the theme parks a miss. It was the best holiday we have had. The beach is superb and the sea food the best. We will be back summer 2001/ 2/ 3/ 4/ 5/ 6/ 7 and for as long as we can." "I am fortunate in that work affords me the opportunity to visit your lovely beach at least once a year. Over the course of the years I've met some really wonderful people in clearwater. Just last year I ran into a group of fine folks from Buffalo who were really enjoying all Florida has to offer. I sure hope "Randi" and his delightful baritone make it back. The sunsets just won't be the same without him bellowing "Chicago" in his velvet tone. I Began vacationing in Clearwater Beach 8 years ago, when I was single. I saw an ad in a local newspaper and decided to give it a try. I'll never forget the impression that I got as I drove out onto the island the first time. It was love at first sight. Since then, I proposed to my wife on the beach, honeymooned on the beach, and 2 years ago, brought my children along for the first time, and as I knew would happen, they're in love with the beach too. We're now planning this year's trip for November, and just can't wait to come back to our second home. See you soon ,Clearwater Beach. I have been going to Clearwater Beach for 13 years, at least three times a year. I consider it my second home, and am so impressed with everything there, that I am going to attend college nearby and commute from my Clearwater Beach family-owned condo. After visiting it just a few weeks ago, I am anxiously waiting for it to be remodeled and I just love the roundabout, it makes it look like something from Europe! My family is going to retire down there, and all my aunts and uncles love it it too. I can't wait to go down there for Spring Break 2001!! "...great fishing, great guide services, and everyone is friendly. We feel right at home being there. Every year I can't wait until winter just so we can get to Clearwater Beach." My wife and I have been enjoying clearwater beach for many years. Clearwater is the nicest beach we've been to. Have travelled the US; Hawaii, Carrabean, Florida, etc., But Clearwater is still THE BEST. Hello im Thomas from Germany and in April i come to clearwater for the 3 time its one of the best placec on earth. SEE YOU!! Just came back from Clearwater Beach a few weeks ago and can't wait to go back. It is beautiful, clean and just a great place to vacation...See you next year, Clearwater Beach! "My husband and I had started vacationing at Clearwater Beach 15 years ago before we had any children. Now 2 children and 15 yrs. later we still find Clearwater Beach to be our favorite vacation spot. There is plenty to do whether you are a family or just vacationing with friends. We are looking forward to our next vacation at Clearwater Beach." I have been coming to Clearwater Beach since I was little and love it now I bring my husband and little boy down. It is such a clean beach and we plan to move down in the not to far future. I spent 10 days in Clearwater Beach. What a time me and my wife had: clean streets, clean beaches, and good food cheaper then i thought. We'll be back next year. Good job Clearwater! "I lived on clear water beach for five years and there is nothing like it. i tell all my friends to go vacation there. clear water beach has it all. u will not be disapointed with this vacation." My husband and I just got back from Clearwater Beach. We love it there. You can walk to just about anything. We got a car and even drove to Universal Studios, which was only an hour and half away. We stayed at the Barefoot Bay Resort and it was really nice and affordable. The manager was very polite and so friendly. I would definitely recommend staying there. The beaches are beautiful and clean. We could always find something to do any time of the day or night. I look forward to going back. I just took my girlfriend on vacation to Clearwater Beach and it was excellent. It was my first vacation since graduating from college and I couldn't have picked a better place on earth. This was an absolute perfect get away and I encourage anyone to take a trip to Clearwater Beach. There were a ton of fun things to do around the area and the people were fantastic. We went to Tampa, St. Petesburg and Ybor City which are all within a short driving distance of Clearwater Beach. Just try it and you will like it. We vacation in Clearwater at least once sometimes twice a year. Fabulous! Easy access to everything your heart desires. The beaches are wonderful, Pier 60 is Great.. The restaurants and hospitality of all the businesses is great! I just cant say enough. My kids love it! You will Have nothing but pleasant experiences in Clearwater Beach, Florida. My husband and I are eagerly awaiting our June vacation. We have been to Clearwater every year for 4 years and it is like heaven on earth! Paradise! We love to walk to the northern point of Caladesi Island.....that for sure must be heaven! It is beautiful, peaceful, relaxing, fun and a long ways! We will count down the number of days till our long weekend on your beautiful beaches! I went on a dolphin encounter and could not have been MORE pleased!! I think we saw at least a dozen of them playing in the boats wake! The Captain went out his way to make this a unique experience!! The boat is small but mighty!!! Go out of your way to experience this!! You will be thrilled to see the dolphins so very close!!! I have been coming to Clearwater Beach since 1955, when my grandparents first moved there. I have been bringing my kids there since 1988. It is the best beach I have ever visited. I think Clearwater Beach is the best place on earth! I love the atmosphere there and the people are as nice as can be! The whole beach is really clean and I love it there! I am really looking forward to coming in late March! God bless! Florida is my favorite place to vacation and Clearwater beach is one of the nicest. I came here 5 years ago for a vacation, came for two more years (winter) then went back to new hampshire came back the next year and never went back, and I had my stuff shipped down and then sold my house up there, i moved to palm harbor because its close to clearwater beach, and very nice here to live and the beach is only minutes away. Although I have not been to Clearwater Beach since my grandparents passed away in 1996, I have many happy memories of summers and holidays spent there. From The Palm Pavillion to Frenchies Restaurant, Leverock's to the Mandalay Surf Shop. I will be staying in Orlando in February and I will definately be traveling to my home away from home: Clearwater Beach! We cannot wait to sink our feet in warm sand! It snowed here yesterday and had an ice storm the day before. Your beach looks beautiful, and I'm sure we won't be dissapointed! My grandparents came to Clearwater Beach every winter in the 50's 60's and 70's. When I came to visit for the first time, I realized why they always came back. I'm still trying to find the mobile home park they used to stay at..just out of curiosity..
Just can't wait to get to the beach. Spent two weeks last year this year a month. Love the food, relaxing, sun, etc. Last Summer was our first time staying in Clearwater beach that it was one our best time our family really enjoyed walking on the beautiful beach. They keep place so neat and clean that the people in the area were friendly and polite. We are planning going back this summer with along my three other families plan to be there too. I advise those who thinking about vacation should go to clearwater beach. "We have been coming to Clearwater Beach at least once a year for the past 11 years. There is no place in the world like it. In fact, we are planning on relocating to the area as soon as possible. It is a great place to retire. We have never had a bad time there. The sun, the sand, and the people all make it the ideal vacation place. And the sunsets are spectacular." I have been going to Clearwater for 27 years on vacation and staying in the same motel. This is the only place we ever go on vacation you will be very pleased with the nightlife, things to do and see. There is something for the young and old. This a fantastic vacation place for families. 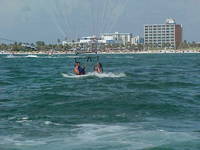 "My family and I had a wonderful time vacationing in Clearwater Beach this summer. We loved all the restaurants on the beach, the sunsets, and the water sports. We will try to return sometime soon!" "We have enjoyed coming to Clearwater to vacation for the past 20 years. Last year my daughters cheerleading squad competed in Tampa and I recommended all the parents to take a drive to Clearwater. They were so impressed that many are planning to vacation there. They especially liked the white clean sandy beaches and great hospitality they received in the area. This March we will be cheering in Myrtle Beach and we plan to take an extended vacation back down to Clearwater." My husband and I first visited clearwater beach on a drive. It was our 10th wedding anniversary. We live in bradenton, so it is a short distance from home but it feels like a real getaway. We have now been going there for 8 years and love everything about it. We love the ride and always visit tarpon springs. There is so much to do on the beach and the night time concerts at the pier are wonderful. We really get to relax and we plan on visiting for a long time to come. Thank you to all the Clearwater Beach residents you are very kind. Hi, my name is Frank, I am 31 years old and I like Clearwater Beach so much!!! It's a wonderful place to have wonderful vacation. I have relatives in Palm Harbor and so I know Clearwater Beach. I have been in CB 4 times and I hope I will come back soon. Because CB is great!!! "No matter where we've been on vacation, no other place compares to Clearwater Beach! No matter what you enjoy doing, you can always find it there. My wife love the ocean and beach, I love deep sea fishing, and our son loves everything about it." My husband and I just got home from Clearwater Beach. We didn't want to leave! We had a wonderful time while we were there. We got married on the beach in '98 right in front of the Clearwater Beach Hotel. It was amazing being able to go back to the spot we got married in and walk on the beaches at sunrise. I'm already planning for when we come back! My husband and I have been coming to Clearwater Beach for almost 28 years. What a beautiful place to spend some relaxing time walking the beach, watching the dolphins play, enjoying the water craft, loving the beautiful sunsets - each one special, and the great people we have met over the years. We have become friends with the Pirates Ransom owners. What beautiful people. Ohoy Matey!!! Over the years we have made some great friendships as our group meet each year at the same time and same place. We have friends that come from England, Canada, and all over the U.S. We have told many people that you can forget Hawaii, we would take Clearwater Beach any day. Nothing better than sitting at Leverocks having a nice dinner with your best friend and husband, watching the boats go by, enjoying the playful dolphins, people fishing, jet skis, etc. And be there at sunset, and what a beautiful view. Is this heaven or what? My wife and family have been vacationing in Clearwater Beach since Christmas of 1984, need I say more. We have changed our Vacation schedule to April, but nothing is different. We love the beach, the restaurants, and most of all the beautiful weather. We are now discussing the probability of going down for Christmas again this year and then again in April. It is really impossible to name all the reasons we continue to go to Clearwater Beach after all these years. I guess the best thing to say is "Try it and you'll understand'. There is no place like Clearwater Beach, this year we decided to vacation somewhere else and must say it didnt compare to Clearwater. Needless to say we will be back in 2005. My children just love it there. The beautiful beach, great restaurants and the Pier. Its just a great family vacation. I highly recommend Clearwater Beach to everyone.! We have been coming to the beach for over 35 years almost every year. "Our family of four had a super time on the beach. This was the best vacation we ever had. There was something for everybody...and great people!!!" We just came back from a week at Clearwater Beach - We stayed at the Ramada Gulfview and had just the best time. Are already making plans to bring kids next year for a week. What a great place!! On days when I'm fighting the gloomies, or when the cold weather has just gotten to be too much, I get out my pictures or go to this sight and remember what wonderful vacations we have had at Clearwater Beach. We're planning for another one! Hi. I First came to Clearwater Beach 11Years ago. I will Always remember my first thoughts as I came over the causeway. WOW!!!!!!!! Absolutely Beautiful. The whole island is filled with fun & joy, So much to do, you never really need to leave the island!! Since that first time I have returned many times & each year the place gets better. The new entrance to the beach is amazing. I will be returning to Clearwater beach in two weeks time (6th Feb 2002) this time married with a young child and I can't wait to see the look on my wife's face as she to comes over the causeway onto the island. I to are looking forward to seeing the many improvements that are continuously be done ( if you can improve on perfection) CLEARWATER BEACH IS HEAVEN ON EARTH - PURE PARADISE!!!!!!! My family and I go there every year for spring break and we've been going down there since 86. The beahes are beatiuful and everything is justn perfect. We stay at the tropical breeze hotel. It's very nice. I cant wait untill we come down again for SPRING BREAK 2002!!!!!! I never understood why our friends always went to the same vacation destination until we started going to Clearwater Beach. Clearwater is our home away from home every summer and we count down the weeks until we can check into our favorite place. "Kids Week" is awesome and the volunteers are fantastic. It's a place where you can park your car, walk and enjoy everything that Clearwater has to offer!! Hope to see you there in JULY!!! Visited CWB for the 2nd time in June of 2002. Got married this time here. Loved it so much. I am planning to come back to CWB in June of 2003 so my granddaughter can experience her first taste of Florida. In May of 2000, we visited Clearwater for the first time after hearing so much about it from our neice Lisa. It was the best vacation we have ever experienced. The most beautiful beaches we have ever seen, and the water was so clear. We had a beautiful room with a view of the Gulf and each evening we sat by the pool and watched the sunset over the Gulf, breathtaking. Now when we speak of going to the beach, it is always Clearwater that we think of. We are coming back this year. The spectacular sunsets in Clearwater Beach are the best in the world! My family and I always enjoy a stroll on the Pier! The people in this area are always so friendly. It is truely the most relaxing vacation anyone could hope for. A great place for families to reconnect. "The best beach holiday I have ever experienced." "I just checked your web site for the free t-shirt and I won!!!!!! I hope my name shows up on Sept 15th also. We were down there in July. We love it there. It is great!!!!!!!!!!" Planning our yearly vacation has become a nightmare! None of us, 2 adults, 2 teenagers and 2 kids, want to go anywhere else but back to Florida to Clearwater Beach. London, Denmark, Spain..nope, we all have one favorite destination in mind where we spent 2 fabulous weeks only a short time after 9-11-02. Unfortunately, getting all of us halfway around the world, from Bergen Norway to Florida takes both planning and money. But we'll be back! CLEARWATER BEACH is the cleanest beach we have ever been to. No other beach in the US that we have visited to can stack up to CB! I love this beach!! My husband and I fell in love with Clearwater Beach during our honeymoon in 1994. We live in Orlando and refuse to go to any of the East Coast beaches. Clearwater Beach is clean, entertaining, accommodating, and breath taking. The locals are friendly and helpful. You are guaranteed to make wonderful memories. My wife and i just moved here from NJ and where awestruck by how clean the beach is, plus they have chairs and umbrellas, which you have to rent in NJ. Plus you have to pay $4.50 to even get on in a beach in NJ. This is on hell of a town!!!!!!!!!!!! Hello, clearwater beach is my favorite vacation spot. I've gone twice and last year my boyfriend proposed to me right on the beach! This year he said he was going regardless if I went or not. I told him no only because I'm saving money for a car. I finally broke down and told him that I wanted to go. I couldn't bear the thought of him calling me from the beautiful beaches while I sat in rainy and depressing syracuse. We got engaged on March 20th and we plan to and go to the beach that night. There is so much to do and it just gets better and better each year. Got the T-Shirt. I just love the area - have vacationed there 3 times in the past 10 years. Hope I can win the contest!! "Wow, this is Paradise !! This is my first visit to Clearwater Beach, and it is a place that I will return to for years and years to come. The white sand, the glistening water, the tiki bars, and the friendly atmosphere have made my vacation, one that I will remember forever!" I lived in clearwater 15 years. I'm in Pennsylvania now and I desperately wanting to relocate my family back there. There's no place like home. Clearwater Beach is by far the most BEAUTIFUL BEACH I've ever seen. I recently visited Clearwater Beach. My friend and I drove all night and day from Ohio to get there on Friday evening. When we got there and I went to check into the hotel my window in my car door wouldn't go up. I went in to the hotel to check in and came back out and it still was stuck. I was very upset, as you can imagine and I didn't know what to do. Not only were the others on vacation helpful and caring but everyone who worked there was too! I especially think the people at the Goodyear shop on Rt. 60 and the Ramada are some of the kindest. They made me feel much better by letting me keep my car parked up front where it could be watched all night until I could get it fixed the next morning. At Goodyear they were extremely friendly and helpful! I cannot wait until my next visit! I have never been to a place where EVERYONE you come in contact with is in a great mood! "My family and I have been to Clearwater Beach several times over the past 18 years; it is our favorite place to vacation and we expect to someday move there. No matter where we've been on vacation, no other place compares to Clearwater Beach! No matter what you enjoy doing, you can always find it there. My wife love the ocean and beach, I love deep sea fishing, and our son loves everything about it. It is a great place to vacation, and it's a beautiful place with a wonderful beach."